I’ve recently replaced my rectangle coffee table with a round one. It was initially out of necessity, but I quickly fell in love with this new shape in my family room! 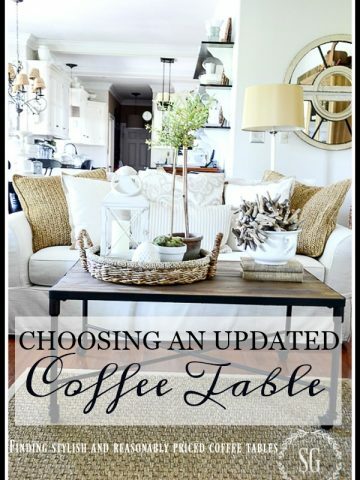 So, let’s talk about choosing a perfect coffee table for your home! I think you may love a round coffee table too! With three little ones frequenting our home and two of them toddles and the third soon to be sharp corners were a concern so I opted for a round table that was sturdy enough to use as a play area too. Both rectangle and round coffee tables may have glass. And it is my preference for a round coffee table. First of all, glass is transparent and has little visual weight while having a great beauty. Glass also cleans up easily! The only con is that glass coffee tables can break. But most coffee tables are made of tempered glass and very safe. 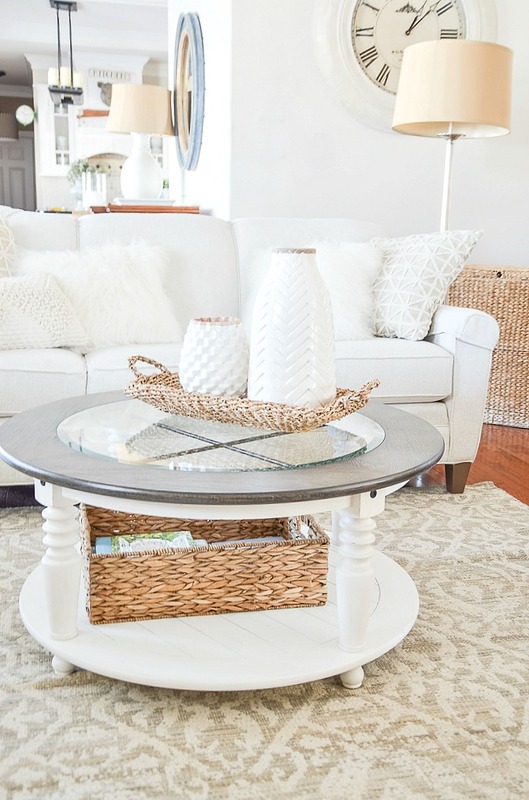 With so many square or rectangular surfaces and boxy furnishings in a family or living room, a round coffee table can really soften up a space and make the overall look of a room very pretty! I noticed this right away when our round coffee table was added! Round tables have come a long way! Now they are available in lots of sizes to meet your specific needs. Just keep in mind the larger they are the more circumference they have and the more room they take up. So measure the area of your room a coffee table would fit in carefully and choose accordingly. We opted for a coffee table that was on the smaller side because our family room is not huge. And we like to have space for the little ones to play when they come. Round coffee tables don’t often take up as much space in front of a sofa as their long rectangle cousins. So, you can stretch out those legs if you are not sitting directly in front of it. For us, this was a huge advantage. I have long legs and really enjoy having the option of stretching out! Round coffee tables, like all other, come in a plethora of various materials. Choose the ones that fit your lifestyle. And they come in so many styles. Round coffee tables tend to be more of a focal point than rectangle ones. So choosing the perfect style is important! And remember the more glass and metal the more fancy and formal a coffee table looks. We chose a durably constructed table with a bottom shelf. The shelf affords extra storage space. 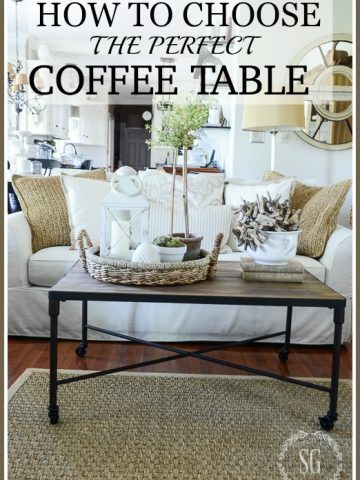 I think round coffee tables could make a great addition to your room as it did mine! 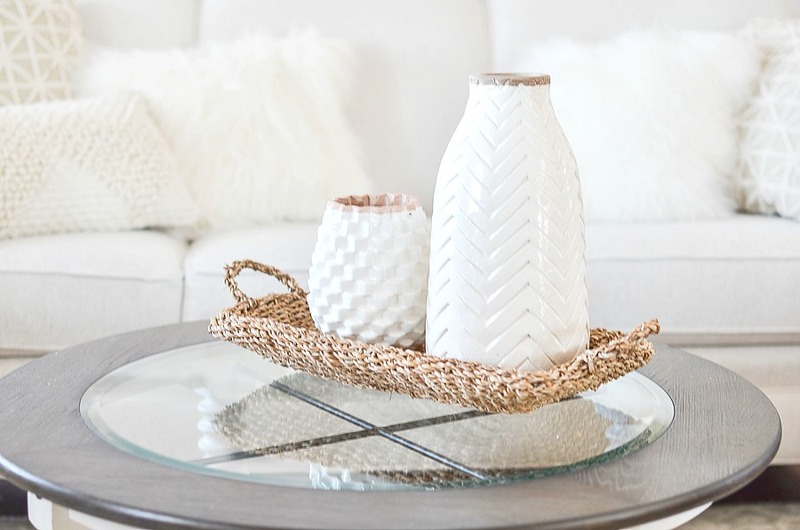 Here are some pretty coffee tables I’ve found just for you! Thank you for a great blog. I too, have just purchased a round coffee table for both our living and family rooms. The one thing that wasn’t mentioned is that it is important to consider the height of the table. I came home with a few floor models only to find that they were too tall for the space. Also important, glass can scratch very easily so it is not always a great choice with small children. We own a glass company and a round piece of glass costs up to three times more than a square or rectangle piece. 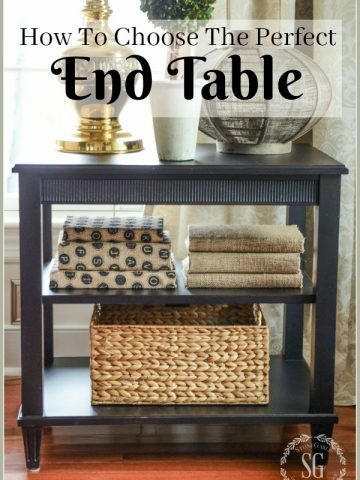 Therefore, an inexpensive table may suddenly become expensive if you need to be replacing the glass. Come back to the podcast! I miss you so. I love the other two ladies, but without you the life is gone. Come back! Hi Jane, leaving DTT was such a hard decision but a good one for me. I now have three grandbabies and they are still babies. They are a drivable distance but it is not short or easy so I usually stay overnight (or a few overnights). I want to be a big part of their lives and also help their mammas. I hope I will be invited back soon, I miss DTT too! I love your thoughts here and the room is beautiful. I have had a round table (stone top, super easy) for years and now want a square one for so many reasons. You can always stretch your legs out if you don’t have a bottom shelf. But the only person that can reach their drink that I have served them is the person sitting in the very middle of the sofa. That goes for appetisers I also put out on the table too. One has to get up and down to set down their drink, take a drink or eat. When small children fall standing at the table, the round one does not catch them on the way and they hit the side of their little face very hard on the way down. Now I’m so confused : ) I guess there is n o good answer – it’s just what you like and what fits! Your new table looks wonderful in your room, light and airy.I have a rectangular table with a glass top and glass sides, it has 2 small doors that open to display items like a curio cabinet, it’s a unique piece. As always, an absolutely lovely design change~! Your table looks just gorgeous. While it is slightly, off topic, due to space issues, I recently opted to replace a lovely and large rectangular dining set for a country style round oak kitchen table and chair set. The round shape is so warm and welcoming. It may seem like an obvious point, but I will also mention that if anyone is interested doing this thing, I recommend being sure to account to space for these chairs to be pulled out comfortably. Well, after 40 years of not having a coffee table I have been thinking about bringing one back in. My oldest son (now 45) fell on our coffee table when he was 5, resulting in stitches 🙁 so out the door, it went!) We have lived fine without one but this post has inspired me to go ahead and get one. I love the round ones you shared! I feel I have a personal shopper sometimes when I read your posts with pros and cons for various items. I agree with Lisa, your rug is lovely. I followed your link and got a closer look….the texture is great! Does it clean easily? Thanks for your charming ideas. Love your table, Yvonne. The white is so refreshing yet not too country with the other elements. I have had glass top tables for the past 20 some odd years, round, square,oval and now an oval that sits atop a “rowboat” base. They are the easiest to keep clean and I’ve never had a glass break. In fact, all of my tables are still going strong even though they reside in new homes- my son’s, my sister-in-law’s. Since I generally have a sofa/loveseat combination perpendicular to each other, a round table fits perfectly. My current table which is oval sits corner wise across the area which is good in our smallish room here at the lake. What a charming idea to have the glass on top of a row boat base~! I’d love to see photos of this. If I knew how to send a photo to you, I would. I don’t think we are allowed to send pictures to the site. I want a picture too! Happy 2019, Yvonne! Your new cocktail table and rug look very pretty. I like round tables, but cannot seem to give up the large drawer in our chunky, square table. Having a lower shelf under your table is a definite bonus for the “grands”! I continue to miss you on the podcast, but enjoy your daily posts, as always! So glad you are happy with what you have. I once had a really lovely rectangle coffee table with a drawer. Great for remotes and coasters! Yvonne, I can certainly understand the round corners having seen eight grandchildren through the toddler stage and my ninth still in it. How do you ever child proof your beautiful home? I know before my babies came to visit a lot of things got out up on higher shelves and many a vignette was disassembled. The days when the grandchildren are small go by so quickly it is well worth a bit of home adjustments. ( My oldest is now in college). Enjoy every moment with them. The retired teacher in me wants to chime in and suggest putting down table mats or under the rug nonslip material when children come to play on a glass table. I agree! My babies are just 3, 18 months and 6 months. Other than the coffee table there is not much they can reach. The fireplace is a big attraction to them right now. Can I ask where you purchased your living room rug? Love the color and looks soft? Mine is rectangular. I like the longer length stretching across the sofa. It’s a traditional shape with a glass top. I like the how the glass reflects the chandelier above, you can set food & drink on it and with a spray of windex it is clean. No, a round one would not work in my set up but I can see where it would be perfect in a smaller seating area or with a sectional. Love this table! Where did you find it? Hi Beth, unfortunately, Wayfair is not carrying it right now. Seems when I get something in my home Wayfair sells out of it! Sorry! There are a few like the one I have that I shared today. I like the idea of a round table. I will think about that when I update my sectional sofa, which will be soon! Thanks for the valuable information. 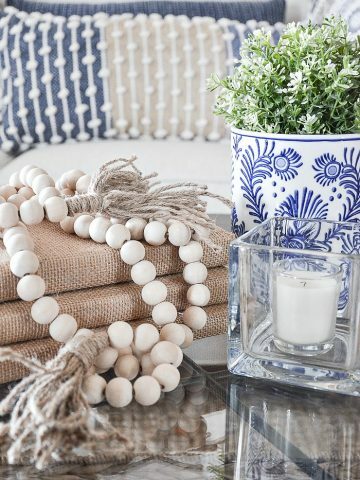 Love the hobnail! Where did you find those?